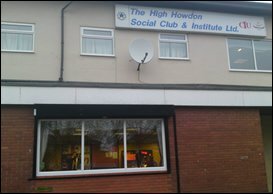 The High Howdon Social Club is based in Howdon, North Tyneside and has been the heart of many people’s days and nights. We are located about 5 minutes away from Howdon Metro station and about 2 minutes from many bus stops. The club is not hard to miss as it used to be an old picture house. As a result, we are situated in an extremely large building. You have the choice of our bar, lounge, or our fantastic concert room. Our bar is equipped with 4 large televisions which show live football, horse racing and other sporting events. Along with our dart board we also have two of the finest snooker tables in the north east. As well as our new pool table. We host many events, ranging from concerts and live bands on a Friday and Saturday nights, Snooker tournaments and Darts tournaments. If you like Bingo, why not call in on a Friday evening, Saturday evening, Sunday morning, Sunday evening or Tuesday evenings. We have flyers and full Bingo books with very rewarding prize money. We have Domino Cards, Meat Draws, Raffles and much much more! Why take our word for it, check out what’s on over the coming week and give us a visit.